It was Canada Day, back in 2011 (I think). We had caught a bus from the west end and arrived downtown mid morning. There were already several people walking about. It was a great day. We had no plans and it was a good thing too. Prince William and his new bride Kate were in Ottawa taking in the festivities and as a result security had roads blocked off from where the Royal entourage would travel. As a result we got veered off course and ended up on Sussex Drive. We were trying to walk to the Jacque Cartier Bridge but somehow got re-directed. It was okay though, we saw some cool things. 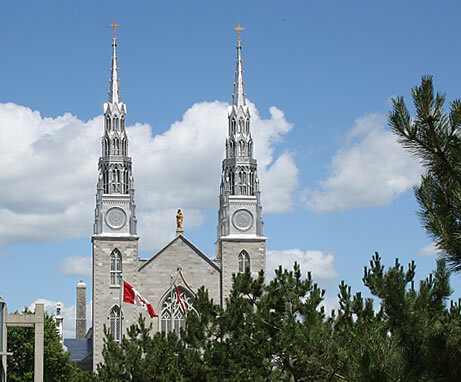 The Notre-Dame Cathedral Basilica, Ottawa.